it is possible to create redirects in WordPress without setting those redirects in Htaccess or your nginx config file. This is possible thanks to an excellent wordpress plugin called “redirection“. Thanks to this plugin you can set up internal and external 301 redirects and much more. It also displays the number of hits for every redirect and the last access date. Thanks to this plugin you can set up 301, 302, 307, 308 redirects. You can also redirect a page or a regex to a 404 error code. It can use conditions like referrer, login status, cookie, server, HTTP header and custom filter to determine what the redirect should be. It is also possible to determine if the redirect should be handle by WordPress, Apache or Nginx. 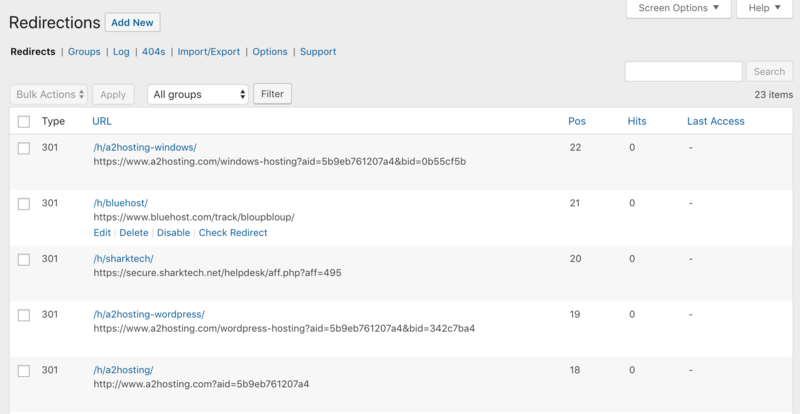 You can see the list of user-agent, referrer and IP addresses of the clients that clicked on a redirect handled by the plugin. There is also a very handy 404 error logs. This means this plugin help you to spot all the 404 error code events that occured on your website. This helps for example to find that a robot scans your website by trying URLs that don’t exist. You can import or export your redirects in a file. So, if you have created many redirects for your affiliate links you can back them up in a safe place.